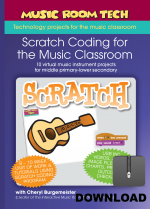 Coding has become a skill which all students need to learn in the primary school years. It provides opportunities for cross-curricular learning in mathematics, the sciences and the arts. 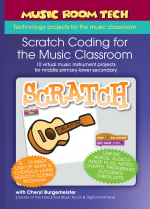 Here’s a simple way to introduce it – Scratch Coding for the Music Room makes it easy with step by step tutorials, videos, audio and image files, notes, charts, proformas and outcomes checklists.